Visitors to the early 19th century Stembridge Tower Mill in Somerset, south-west England. Stembridge Tower Mill in High Ham, near Langport, Somerset, is now to be open to the public on the first and third Sunday of each month. 1pm to 4pm. Tickets, which include the admission to the interior of the mill, are priced at £4 for adults, £2 for children. National Trust members get free admittance. These open afternoons are led by the archaeologist, historian and current tenant custodian Simon Haines. He and his assistants will be on hand to answer any questions related to the history of the mill. The mill grounds are closed to the public at all other times. More about Stembridge Tower Mill. 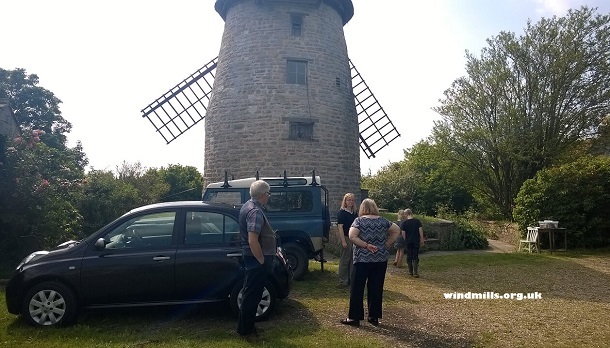 This entry was posted in Windmills and tagged high ham, mill, NT, stembridge, windmill on May 16, 2014 by Tower Mill.